These topics air Wednesday April 23, 2014 at noon and 8pm on 90.5 WESA. To leave a question or comment before or after the show dial 412-256-8783. Join the conversation LIVE between 12pm & 1 pm weekdays at 412-246-2002. More Essential Pittsburgh segments can be heard here. 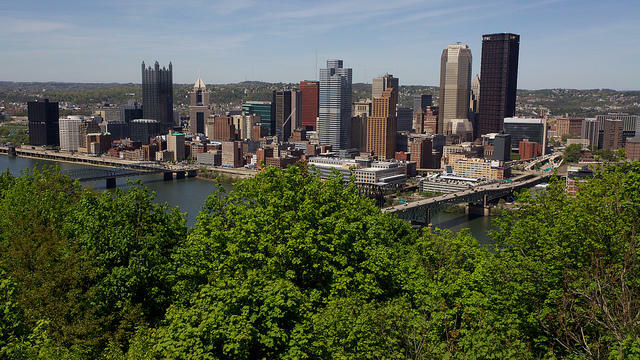 Update In 2012 Pittsburgh was one of four cities nationwide to launch the 2030 Challenge for planning. It’s a voluntary, private/public initiative with the goal of reducing the environmental impact of buildings, by reducing energy & water use as well as transmission emissions. Last year the city hosted the first ever national 2030 District Summit. Sean Luther, Pittsburgh 2030 District Director for the Green Building Alliance gives us an update on where the city stands in meeting its goals. People are often told to do what they love and the money will follow. However, that’s easier said than done and doesn’t always work out the way people hope it would. In this month's On the Job segment independent career consultant Sasha King addresses the facts and fallacies about finding your bliss. Thursday is Take Our Sons and Daughters to Work Day, it’s also the date for Pittsburgh’s Equal Pay Day Rally, this is no coincidence. Nationally, women make 77 cents for every dollar a man of equal standing makes, and in Southwestern PA, that number drops to 73 cents for every dollar, according to the Women and Girls Foundation. We’ll talk with Heather Arnet, the CEO of the Women and Girls Foundation, about how the wage gap impacts women and families in the region.